Today I’d like to introduce you to Nancy, from Skinny Kitchen. Skinny Kitchen is your fun guide to healthy yet decadent-tasting foods. Each week Nancy shares skinny recipes, cooking and kitchen tips, food finds and the healthy benefits of many recipes. There’s also nutritional information and Weight Watchers POINTS PLUS on each. All recipes include mouth-watering photos. You’ll be delighted with the huge calorie and fat savings when you make these yummy recipes the Skinny Kitchen way. 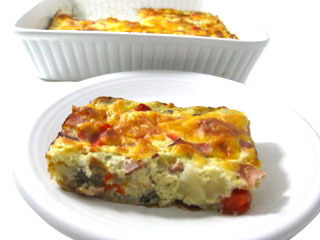 Start the day off completely satisfied with this NEW, wonderful, low calorie breakfast casserole. It’s really simple to make and freezes great too.Each serving has just 147 calories, 4 grams of fat and 3 Weight Watchers POINTS PLUS. I think you’re going to LOVE it! 1. Preheat oven to 400 degrees. Coat a 9 x 9 inch baking pan with cooking spray. 2. In a large bowl, mix together the frozen hash browns, ham, red bell peppers and onions. In a medium bowl, whisk together eggs, egg whites, condensed soup, milk and black pepper. Pour over potato mixture and toss to mix. Add mixture to baking pan. Cover with foil and bake for 30 minutes. Remove foil, sprinkle with cheese and bake an additional 20 minutes until golden brown and cheese is melted. 3. Cut into 6 slices. Using a spatula, carefully remove each slice. 4. This casserole freezes great once baked. I like to wrap into individual servings and store in the freezer. Great for a quick breakfast any day of the week! Diced frozen hash brown potatoes can be found in the freezer section of most supermarkets. They come diced and contain no fat, just potatoes. Diced potatoes work much better for this recipe than shredded ones. Trader Joe’s sells (8 oz) packages of Black Forest ham. It’s uncured and contains ‘no nitrates.’ In addition, most health food markets sell this type of ham. Or, use your favorite lean ham such as Oscar Meyer. Whenever a recipe calls for using eggs, I love Eggland’s Best eggs! They have less saturated fat, less cholesterol, more Vitamin D, more Vitamin E and double the Omega 3 than regular eggs. Most supermarkets see them in the egg aisle. Join Skinny Kitchen weekly, and on Facebook, as Nancy shares new recipes. Reap the benefits that delicious, healthy food can bring to you and your family. Skinny Kitchen makes cooking an exciting and appetizing experience. Thanks so much for featuring my recipe today my sweet friend!!! I hope everyone enjoys it. Made this recipe this morning. It was delicious! That looks scrumptious, I have to make it!! !